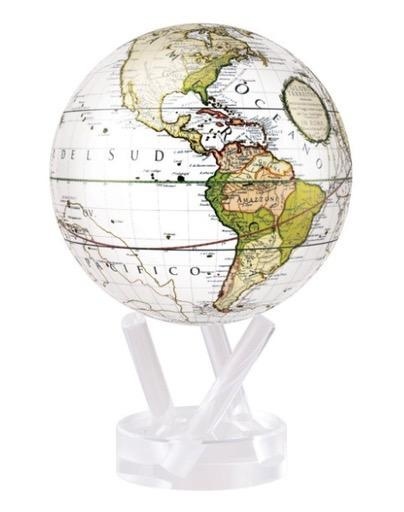 The Antique Cassini Terrestrial White globe combines a vintage map created in 1790 with modern updates that make it unlike any globe you've had before. Every continent and ocean is shown with absolute clarity and contrast, and it features lines showing the three voyages of Captain James Cook–a design element first created in 1790 by Giovanni Maria Cassini. The map also shows the United States which was very young at the time and not included on many maps. With its smooth, independent rotations, it's like history comes to life in your home or office. 2015 Luxury Gift of the Year Award Winner Antique map from 1790 Features latitude and longitude lines A red ecliptic line is also present, showing the sun's position each day of the year. Note there is no Antarctica because James Cook didn't believe it existed. Turns using ambient light Hidden magnets provide movement No cords or batteries HOW IT WORKS MOVA Globes combine effortless performance with eye-catching graphics. 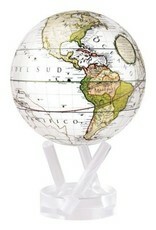 Each handcrafted globe mingles vibrant artwork with our patented technology for flawless rotation without batteries or messy cords. Hidden solar cells use ambient light for power, while the earth’s magnetic field provides the necessary torque. These elements work in unison to power a whisper quiet mechanism, allowing the globe to rotate within a clear outer shell. Each piece is assembled with such precision, it appears the inner and outer layers are one – rotating without any outside power source.